Students can program apps. They can pitch their ideas. They can handle defending their dreams. Students can code. Students can create. Those who think students can’t do these things either haven’t tried or have a limited view of themselves as educators. Tomorrow I’m taking three teams of kids up to the National Ed Tech Developer Tour Event up in Atlanta, Georgia. (A few more tickets might be available.) The trailers of the three teams are shown below. They’ll be presenting about their apps and ideas. Two teams already have their apps live on the iTunes and Google Play app stores: #iCare and #Drone Zone. 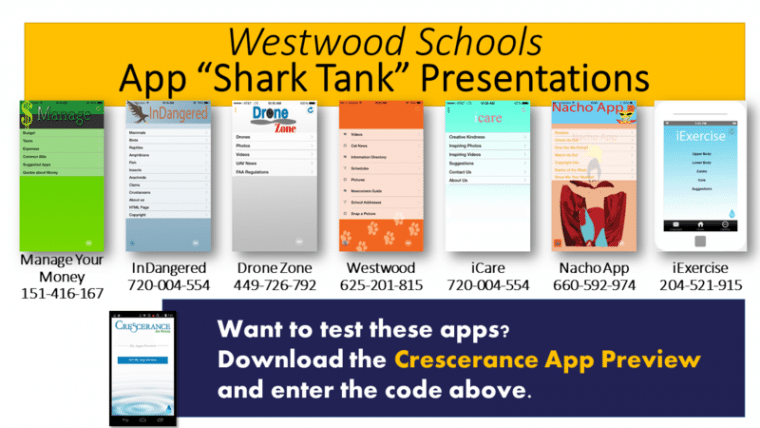 App programming with Crescerance has been awesome since I first learned about it from fifth grader Kennedy and from Susan Bearden at ISTE 2014. So, now, we level up. I’m excited for them and our school and look forward to the event tomorrow night. Because it may be called a “Shark Tank” but I see nothing but encouragement and support for these kids. Want to know more about our Shark Tank event this past spring? Here’s our wiki page on the event. One other exciting note — half of those traveling with me are girls! I see no difference in the success of boys or girls as we program! They may have different apps, but they thrive as they use technology. The post Students Who Make Apps appeared first on Cool Cat Teacher Blog.